The Chilean operator Entel acquired Nextel in Peru in 2013 and renamed it into Entel. At the moment, it is the third cellular operator in the country with good coverage and democratic prices for mobile communications. Entel SIM cards are quite suitable for profitable GSM termination, provided that a proper tariff plan is chosen. Prepaid Sim-cards are available in branded stores, where you will be asked for your ID and fingerprint, as well as on the black market of Peru. They are called Super Chip and cost about $1.5. Entel start plans provide favorable welcome bonuses - unlimited national calls for 3 days and 150 MB of mobile Internet traffic for 3 days. 1 dia. Duration - 1 day. Provides for unlimited conditions for calling the numbers of any mobile operator and unlimited SMS for one day. 3 dias. Duration - 3 days. Provides unlimited conditions for calling the numbers of any mobile operator and 150 MB of Internet for 3 days. 7 dias. Duration - 7 days. Provides unlimited conditions for calling the numbers of any mobile operator and 30 MB of Internet for 7 days. For earning on landing international traffic, the terminator should use the Super Chip's features, in particular, its welcome-bonus. Even if you do not have time to use the unlimited offer provided by the start plan, you will not lose anything before your card is blocked. In fact, you will have to spend money only on buying new SIM-cards, and thanks to unlimited offer, a large number of outgoing calls will not cause the operator’s suspicion. To divert the "attention" of anti-fraud systems, you can also use gsm gateway imei changer and other tools to simulate human behavior. 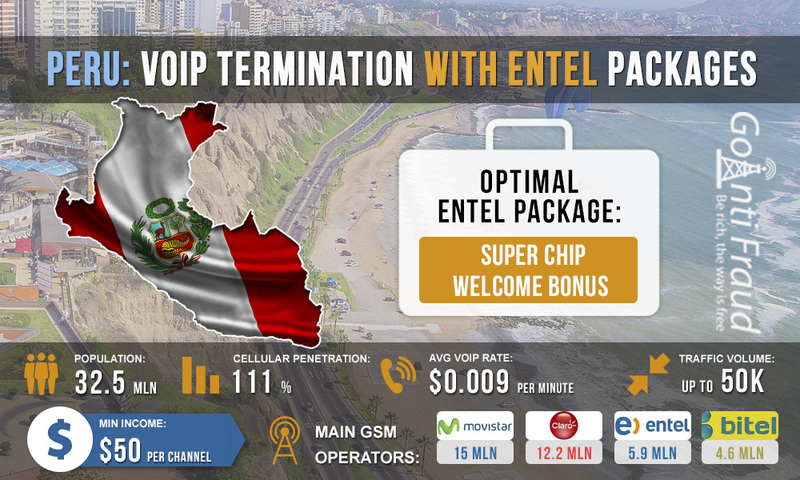 With Super Chip from Entel you will receive revenue of about $ 80 (from each port of equipment, while it's running for 600 minutes per day).